The lowdown: The most eagerly awaited film of 2012 arrives with an Everest of expectation resting on its caped shoulders. 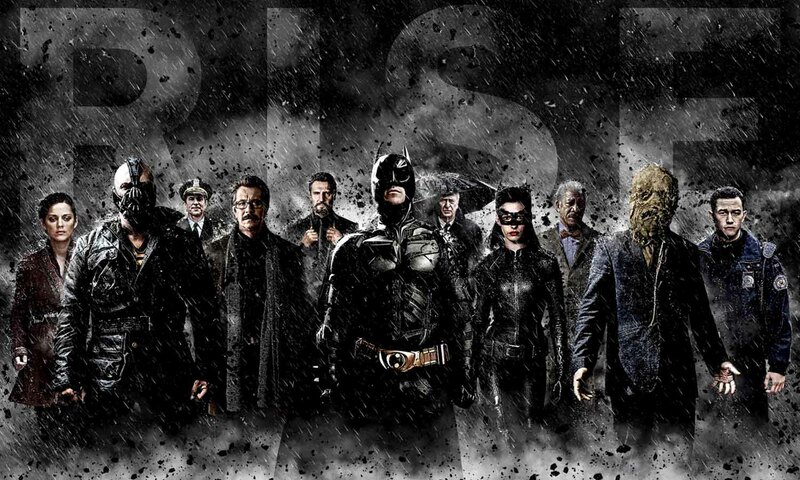 But, with Christopher Nolan again at the helm and series familiars Bale, Oldman, Caine and Freeman joined by hot new blood Tom Hardy, Marion Cotillard and a purr-fect Anne Hathaway, there was no doubt The Dark Knight Rises would deliver the goods. And it does so in awesome and ambitious style, mixing blockbuster spectacle with a gripping story that weaves in the Occupy Movement, banker bashing and the War on Terror. Dark, brooding, violent and fiercely smart, it’s everything we’ve come to expect from a trilogy boasting the best comic book movies of all time. The full verdict: This is not the first time Batman has risen. When Nolan originally took on the Dark Knight, the character was poisoned by the buffoonery of Batman Forever and Batman & Robin. By playing it dead straight and deadly serious, the director oversaw a Lazarus-like rebirth. But, the man likes a challenge and with The Dark Knight he made The Greatest Comic Book Film Ever™, redefining expectations of a superhero movie (to the tune of $1bn global box office). So how does Christopher Nolan not only satisfyingly close his Bat-saga (succeeding where Spider-Man and X-Men are generally accepted to have failed), but also provide a worthy successor to that majestic second outing? His answer is to Go Big. HUGE. There are moments in The Dark Knight Rises that capture that same thrill audiences had when first seeing Metropolis, Star Wars and Blade Runner. The scale of Nolan’s vision must be seen on the biggest screen possible for maximum impact. Yet, this scale isn’t just visual (or aural), but emotional. In place of The Dark Knight’s fiendish plot and anarchic glee, The Dark Knight Rises goes to the heart of what trauma drives a quest for justice, revenge or terror and it’s one of hell of a journey. Those trailers with a shattered Bruce Wayne at super-villain Bane’s mercy? Just the tip of the iceberg. Eight years on since the events of The Dark Knight, the Batman is a phantom fugitive after taking the fall for Harvey Dent’s death and Bruce Wayne a Howard Hughes-style gossiped about in hushed whispers. And with Gotham virtually crime free, who needs a caped crusader? Bruce Wayne. Empty now the Bat has flown, Wayne is a husk marking time, to the despair of faithful butler Alfred who yearns for the billionaire to move on. Things change when cat-burglar (though never named Catwoman) Selina Kyle arrives on the scene, filching a Wayne family heirloom and getting his attention. But, it’s only when terrifying man-mountain super villain Bane arrives in Gotham, preaching liberation for the oppressed masses while spreading violence and murder (and surely the most snapped necks in a 12A movie) that the Dark Knight must rise once more. Allowing himself 164 minutes to tell this final chapter, Nolan again proves his talent for lean, economic storytelling at epic length. 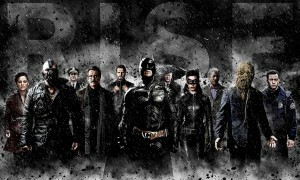 Hitting the ground running, The Dark Knight Rises races through incident and drama (including an early Selina Kyle double-cross shootout that practically guarantees the magnetic Hathaway a spin-off movie) and performs the difficult tightrope act of allowing each character room to breathe while knitting them into the epic multi-strand plot. This is a film where all of Gotham is taken hostage by Tom Hardy’s Bane, a merciless revolutionary with a jihadist taste for public demonstrations of punishment ripped from the darker moments in the War on Terror. And as portrayed by a pumped-up Hardy, he is terrifying: his mask a metallic baboon maw, his voice disconcertingly strangulated (and not difficult to understand, Nolan clearly having heeded online frets), his body a twisted mass of radicalised rage. When Batman faces him midway through (so you get American Psycho vs. Bronson), it is a smackdown both exhilarating and nightmarish in visceral impact. Thank God then Christian Bale decided to return – no-one can do charm, innocence, rage and pain quite like him. He gets plenty of opportunity to do all them, but particularly pain, with Bruce Wayne experiencing a literal Hell on Earth. Fear not however, this Knight is not all doom and gloom. Granted, audiences will be (willingly) put through the ringer, but these particular Batman films have consistently delivered spectacle once only possible on the printed page. Bane’s opening mid-air assault and Batman’s return following an all-out assault on the Stock Exchange and ensuing bike chase both drop jaws and send shivers down the spine, as does the sight of Batman and Kyle (okay, Catwoman), making short shrift of Bane’s cohorts. But, it’s in the final 45 minutes, when Commissioner Gordon (the ever excellent Oldman) and lawman John Blake (newcomer Gordon-Levitt, as good here as in Inception) attempt to break Bane’s siege from within and all the main players come together for a showdown thrilling, shocking and full of surprises that it becomes clear Nolan is the blockbuster director every studio has on speed dial. Ending a perfect hat trick of movies, all that remains to be said is, Chris, please don’t foul it up with an Indiana Jones style fourth instalment.